While I’m waiting for next Friday, when I hope I will have the chance to meet my “heroes”, I will share with you some more impressions from my fantastic mates and fellow David Tennant fangirls Helen Riley and Judy Spreng. Enjoy! HR: My name is Helen Riley. I work part-time in Fundraising Administration for a local Hospice (my perfect job!). I’m married & have a 4-year-old daughter. Did you already know this Shakespearean comedy? Have you already seen other performances of that same play? Other representations of the same text? HR: My only familiarity with Shakespeare comes from the plays I studied at school 30 years ago (e.g., Romeo & Juliet and Much Ado About Nothing). I have never seen MAAN on the stage, but I have watched the Kenneth Branagh / Emma Thompson film, both on its release and once again recently to refresh my memory. I’ve also re-read the play in preparation. JS: I had heard of this play, but I had never read or watched a performance of it before this year. After purchasing the ticket to this production, I saw the Kenneth Branagh movie and then closer to the trip, I bought a version of the play that had the original text on the left page and a modern translation on the right page so I could better understand some of the subtlety of the language. This especially helped in many of the Dogberry speeches, in which he uses a word opposite of what he means. That would be hard for an audience to understand without any preparation. How did you learn about this production? What were the main reasons which convinced you to see it in person? HR: I heard about this production on the day it was announced by David Tennant & Catherine Tate on the BBC Breakfast Showon 8th January 2011. I think if it had been David Tennant alone starring in the play, I would have wanted to see it certainly, but because it was both Catherine & David, I bought tickets that same day, and some more tickets the next day “just in case”! Their work together on Doctor Who and on other occasions, such as for Comic Relief or on radio shows, was enough to convince me that their Beatrice & Benedick would be worth seeing. What is your general opinion about the representation? HR: This version of MAAN was energetic and fast-paced. The nature of the staging meant that little time had to be spent changing the set and this seemed to increase the pace of the production even further. The staging was in fact very evocative of a Mediterranean setting – I don’t think there was a soundtrack of cicadas, but it felt as if there might have been! All in all, this was a fun and exciting show and all of the cast were very good indeed. What is the thing you liked the most, and what did you like about the show? HR: I very much liked the performance of Leonato – the manner of “bonhomie” he displays in the early scenes contrasts with his anger at Hero and subsequently at Don Pedro & Claudio. I had the good fortune to meet Jonathan Coy (who plays Leonato) at the Stage Door and to tell him how much I enjoyed his performance. I was a bit disappointed in the scene where Hero and Ursula deceive Beatrice, as it was almost impossible to hear the actors’ voices over the laughter of the audience, even though I greatly enjoyed the antics of Catherine Tate in this scene. JS: Most of it I liked. I thought David Tennant’s scene where he’s overhearing the conversation between the other men was wonderful. How he can be covered in paint every single night is beyond me. He’s a great comic actor! 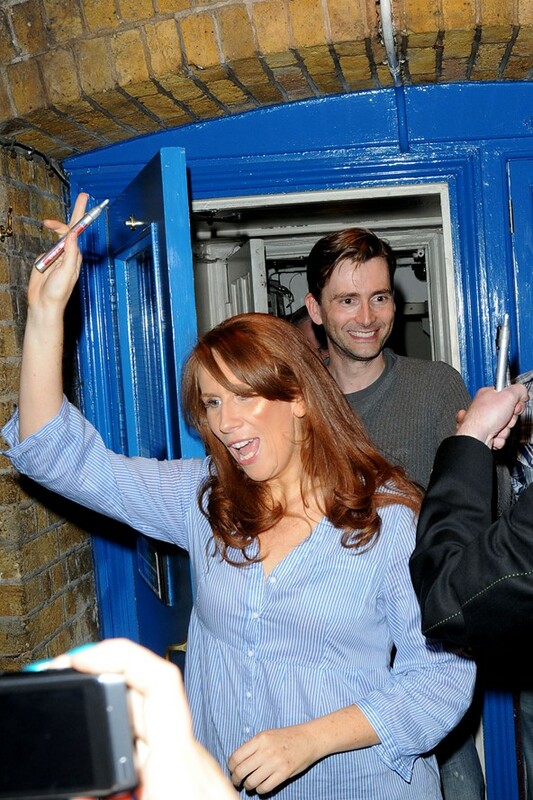 I actually didn’t like Catherine Tate’s overhearing the conversation scene as well. For some reason having her hanging from the painter’s ropes just didn’t sit right with me. On the other hand, she had me in stitches in a little scene where Don Pedro flippantly asks her to marry him. Her reactions to that were priceless! The scene where Claudio seemingly almost kills himself didn’t sit right with me. It was not needed (it’s not in the play, there’s no dialogue) and seemed out of place and too dark. And some of the obvious gags, like Benedick coming into his first scene alone and on a golf cart was near being too “over the top” (although it was hilarious!). But none of the negatives detracted me from having a great evening at the theatre. Do you think that the choice to set it in the 80s was a good one? HR: Yes – the costumes – from white naval dress uniforms to the fancy-dress attire (e.g., New Romantics or Michael Jackson) – were amazing. In fact, some of David’s costumes have to be seen to be believed! The 1980s are far enough away to be history, but close enough to be remembered (by some of us! ), so that was a great setting for this play. JS: I thought it was a great choice. It gave it a contemporary look and feel, but still made sense in the context of the play. The woman who sat next to me the 1st time I saw it wasn’t particularly a DT fan, but just a fan of good theatre. She was so impressed by the staging of the play, she thought it would make a great film. She had no idea we were already trying to get a DVD of the production. How much does music contribute to the fascination of this particular production? HR: The music is very loud, 80s-themed (in the style of Wham! or soft rock, for example) and is almost always present – obviously at the fancy-dress party and in the hen-night scene in the night club, but also from a tape-recorder that Claudio plays. The music itself is a great tribute to the 1980s. JS: I thought the music fit the staging of the play perfectly, but I wouldn’t say it added to my fascination of the production. It made it enjoyable and any other style of music would have sounded out of place. Do you think that DT and CT fit their roles? HR: Catherine gave a lot of “bite” to Beatrice’s clever lines, and the emotion she shows in the second half of the play seemed very real. And, of course, Catherine excelled at the comedic parts of the play and had the audience in gales of laughter. David displayed so much energy as Benedick in the first half of the play, that he seemed almost statue-like in the second half, when events turn more serious. His tongue seems to be made to utter Shakespeare’s beautiful words. Speaking in his own Scottish accent, his words were crystal clear, so that even a theatre-goer unfamiliar with Shakespeare would be able to understand what was going on. Their chemistry together was obvious, even to the point that they seemed almost to be trying to make the other laugh on stage – which certainly occurred in one instance, when Catherine struggled to compose herself before Beatrice’s line, “Against my will I am sent to bid you come into dinner”. They also switched so easily from comedy into a more serious emotion (e. g., at the end of the scene of Claudio & Hero’s “wedding”, when Beatrice & Benedick are alone, when Benedick says “Enough, I am engaged. I will challenge him”, which I found really chilling). JS: Yes, they have great chemistry together, so you can really believe that there’s an attraction there that they both deny at the beginning. Their sparring scenes are great. And you can believe that they would so willingly believe that the other is in love with them, that they fall in love themselves. They portrayed the sudden turnaround, like they were just waiting for an excuse, really well. What do you think Shakespeare’s opinion would it be, if he could have a TARDIS to join us and watch this version of his Comedy? HR: I think Shakespeare would enjoy this production immensely, as it is a lot of fun! It is clearly aimed at a more general theatre-goer rather than a Shakespeare aficionado, in the same way that in his day the plays were aimed at a mass audience. JS: If it was 16th century Shakespeare, he’d have a hard time understanding it, as he’d have a hard time understanding everything in our modern day. But, if he lived in the 21st century, I think he’d approve of this updating of his work and think it was appropriate to the play. Would you like to add something before we say goodbye? HR: I’m inspired to read and/or watch more Shakespeare, as I’ve realised I really love the beautiful words so much. My suitcase is ready and I thank God I am so tired after a full day work that I will sleep like a log tonight. Just hope the buffaloes will be of the same opinion. Stay tuned then and look forward for my Much Ado About Nothing review at last! Thank you for reading! Ciao!! !